We all know what's required to fall in love....a pulse. 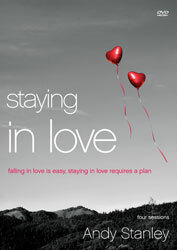 Falling in love is easy, but staying there, that's something else entirely. With more than a thousand matchmaking services available today, finding a romantic match can be easier than ever. But staying together with the one you've found seems to be the real challenge. Each session includes 15-20 minutes of teaching from pastor and author Andy Stanley. In addition to the small group sessions, this DVD is enhanced with four full-length messages from Andy Stanley.